If you’re love watching great content online, a movie buff, and you cannot imagine a weekend or evening without some good TV show, then you can agree with us that this is the best time to be alive. The internet is exploding with great TV shows that keep us glued to our screens for hours. And the best bit is that you’re not spending time watching a mediocre show that leaves you in regret – most of the shows that air today and the ones you stream have great edutaining content that opens up our little brains to the rest of the world. But, there’s one catch, one problem we all struggle with sometimes – finding a legit site to watch a show recommended by a friend or a trending show. The FOMO is real and almost suffocating, and you might find yourself paying for a service you didn’t have to pay for, just because you couldn’t find a place to watch the show freely. Well, that ends today. You will need a VPN to stream TV Shows from some of these sites if you live outside the US. Topping our list is Crackle, a leading video entertainment platform by Sony. This entertainment platform allows you to watch TV for free and you also get to stream free movies from your tablet, phone or computer. While you’d have to sit through an annoyingly good number of commercial breaks while enjoying a movie, the site boasts a great video selection in its programming and the video quality is pretty decent. With about 150 free, high-quality and full-length movies, watchable at any time, and new shows added to the database constantly as the old ones are retired, Crackle could easily the best thing created for you to binge watch movies. You might also like the categorization of movies into thrillers, action, comedies, horrors, dramas, Crackle Original movies, and crime movies, among others. You could also sort through the movie database alphabetically or look through the recently added tab to find new movies. To further simplify your search, Crackle TV has trailers to movies, as well as movie descriptions/ information. In addition to movies, you can also stream free TV series from the list of 75 series with full episodes. The series categories available include thrillers, action, anime, and comedy series. With no limit to the number of videos that you can watch and the fact that you can download the Crackle app to your Android or iOS devices, this site is definitely a great resource to anyone interested in good free TV. Popcorn Flix snags the second spot in our list of the top free sites for watching TV shows thanks to its wide variety of movies and TV shows in all genres. While you shouldn’t expect any newly released movies in its titles, its library has the best of classic movies as well as the big TV hits of the past, not to mention some of the B-movie cult favorites you could have forgotten about. Tubi is yet another impressive site that you can watch TV shows from. The site allows you to stream TV shows, as well as films that are not on Netflix at no cost. While you could just be hearing of Tubi, this site is not new having been around since 2014, and its app is freely downloadable for iOS and Android users. Thanks to the great quality shows and movies, Tubi is regarded as the next best alternative to Netflix which means that whether you’re trying to access a wider variety of TV streaming services or you’re tired of the monthly Hulu or Netflix subscriptions, Tubi’s got you. Just remember that Tubi, just like Crackle is an ad-supported video streaming service that gives you access to great TV from any device. It boasts a wide array of licensed TV shows and movies from several years, most of which are compelling, and worth your time. On the downside, there is no Tubi-original content, and the new releases are few, but you can still access their huge collection of movies and a constantly updated database. Retrovision is the other great site for you to watch/ stream great movies and TV shows. This site offers the best of free online movies, along with hundreds of classics that you can stream from the website directly. With genre-specific menus, you can find the content you are looking for quickly. The movies available on the site are from different genres like comedy, adventure, cartoons, Westerns, horrors, crime, war, and drama. These categories are split further into subcategories. Retrovision, as the name suggests, is a site with most of the oldies which, unfortunately, means that you have to be content with watching poor quality content. Pluto TV goes above the fold offering, not just the best in TV shows and movies but also sports broadcasts, live TV, and kids’ shows. Even though this site has a lot to offer, it isn’t on top of our list because of its complex navigation. But, once you get the hang of things, you will enjoy its exceptional playback quality, as well the quality of content. The other problem riddling Pluto TV is that you might have a problem connecting to the site outside the US. So, if you must access this site from a region out of the US, you might need a VPN server. You might not know this, but Yidio is an aggregator of the free TV streaming sites pointing to third party websites which allow you to watch particular shows. Unfortunately, it means that some of the shows you click on are not free. So, if you’re only interested in free shows (which you are), we recommend clicking on the Free TV shows section online for free streaming. On the Brightside, this site offers access to the latest episodes of the recent and favorite TV shows like Grey’s Anatomy, Rick and Morty, The Flash, Gotham, and Two and a Half Men, among others’. CW Seed us a subsite of CW TV, and it’s one you need to visit. It is entirely legal, and it allows free streaming of TV series. You might also like this site because it’s home to most of the famous original TV series and the DC animated series which are a must watch. We cannot have a list of free content streaming sites without YouTube. However, YouTube doesn’t make to the top of our list given its complexity and the sheer volume of user-generated content. And since you can find anything on YouTube, you have to exercise caution as you stream. The other catch is that other shows, the ones you might be interested in are available on a pay-to-view basis. 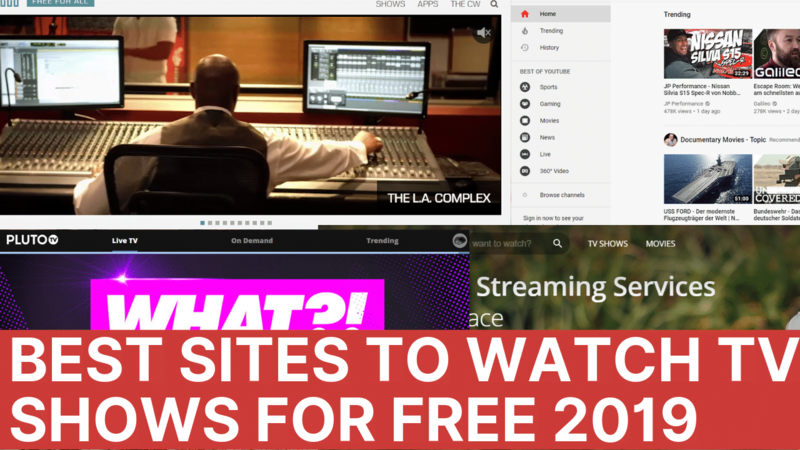 And, there you have it – the ultimate list of the best sites to enjoy excellent and free TV from. But, we’ll throw in a few other sites for keep’s sake – Internet Archive, CW TV, Snagfilms, Yahoo View, Share TV, and FMovies. Now, let’s make some popcorn and rewind!